July 1979, and I'm staying in Fort William from where I'm taking coach tours around the West Highlands. On the Tuesday we visited the Isle of Skye. On the way back from Portree the sun came out (for about the only time that week), and I got my first decent view of the island. 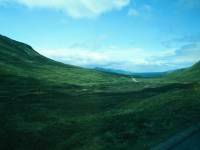 These images were shot through the window of the coach, between Sligacham and Kyleakin. A truly arresting sight the first time you see it, and the novelty never really wears off. 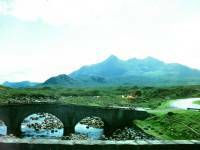 The Black Cuillin seen from the bridge at Sligachan. The conical peak to the left of the group is Sgurr nan Gillean, the "Peak of the Young Men". A tricky scramble, it was considered unclimbable until the 19th century but is conquered almost daily nowadays. 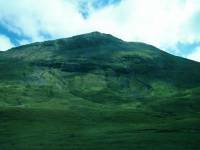 Glamaig, one of the principal summits of the Red Cuillin. 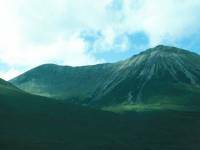 2525ft in altitude, it rises in a uniform and very steep slope, straight from sea level on the shore of Loch Sligachan. 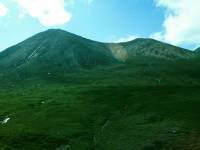 There is a documented ascent of Glamaig by a Gurkha soldier who apparently reached the summit from sea level in eighteen minutes flat. Most of us would be happy to make in in three or four hours if we were even fit enough to attempt it at all. From the same point, the vast glacial bowl of Glen Sligachan. The A850 from Sligachan to Kyleakin runs almost halfway round Glamaig and here we see it from the back, as the road rounds Loch Ainort, From here Glamaig is revealed as two tops (Sgurr Mhairi and An Coileach) connected by a ridge. Glamaig's companions to the south, Beinn Dearg Mhor and Beinn Dearg Mheadhonach. (The names mean "big red mountain" and "middle red mountain". There should really be a Beinn Dearg Beag, or "little red mountain" somewhere). 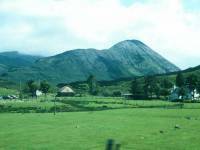 Further south, as we approach Broadford, Beinn na Caillich (2401ft) dominates the view. The name means "peak of the old woman".